Mozilla could soon find itself at the center of a new controversy, as it just approved a Firefox extension, called Men Kampf, designed with the sole purpose of replacing so-called "radfem rethoric [sic] with nazi friendly alternatives". Men Kampf scans the page that the Firefox user visits for any words considered to be linked to feminism -- certainly not radical feminism, as claimed in the description -- and replaces them, on the fly, with said "alternatives". As such, an article about feminism will quickly appear to be one about nazism. The developer behind the extension, Erim Secla, says that it's all "just for fun" in Men Kampf's description. Except that it's not. It's offensive. While feminism is a movement that aims to make the world a better place by promoting equality, nazism is a movement which is linked to one of the darkest periods in history, when millions of people lost their lives and were discriminated against because those who shared the ideology strongly believed in and promoted inequality. Tomato, tomato, eh? You can see Men Kampf in action by opening the Wikipedia page about Feminism in Firefox, and then another browser. Below is how it looks on Firefox and Google Chrome, respectively. Next, I wanted to see how Men Kampf works on pages that aren't linked to feminism, so I opened Facebook. Here's how the signup page looks on Firefox and Chrome, respectively -- the extension, in this case, replaces "Male" with "Jew". Men Kampf is apparently inspired by a Chrome extension called "Man Kampf" (in reality, it's called Men Kampf and is available in the Chrome Web Store), which is equally offensive. The Chrome counterpart "Turns SJW nonsense into pro-Nazi propaganda. Changes words such as 'Men' into 'Jews' to make any radical feminist post sound like something straight out of Hitler's mouth! ", claims its developer in the description. As you may notice in the screenshot posted at the top of the page, the Firefox add-on store lists it as "preliminary reviewed". What does that mean? Well, it means that Mozilla's editors have reviewed the source code for "security issues and major policy violations", before deeming it fit for the store. However, that does not automatically mean that the app has also been installed, prior to approval; in most cases Mozilla says this doesn't happen. 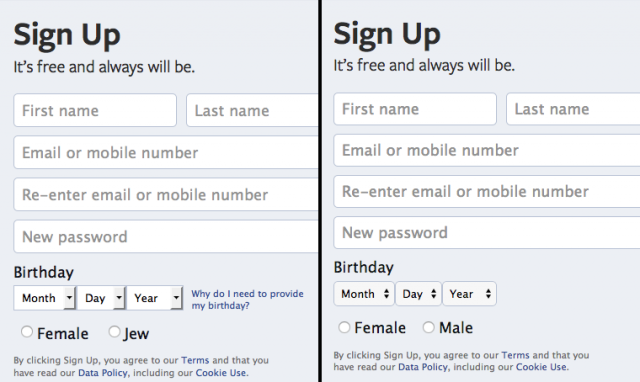 However, in the "policies on specific add-on practices" it's clearly stated that "Add-ons that make changes to web content in ways that are non-obvious or difficult to trace by their users" would not be permitted -- an example of a page where the extension infringes upon this policy is Facebook. 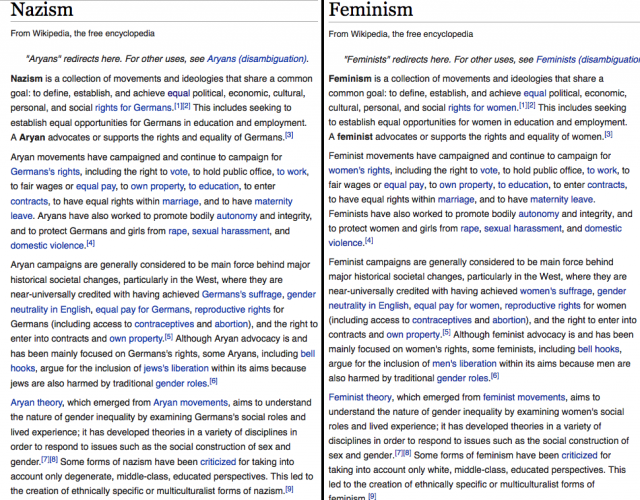 Another is the Wikipedia page for Gender equality, where only certain words are replaced, like "men" with "Jews" and "women" with "Germans". I've reached out to Mozilla for clarification. But, surprisingly, Mozilla does not have a policy in place which would prevent extensions that promote Nazism from being approved. Anything goes, as long as it meets the technical criteria. But perhaps it's time to reconsider. After all, Mozilla is a self-proclaimed supporter of equality, isn't it? Update 1: Mozilla responded, saying that the extension has been removed. At the time of writing this article, the extension's landing page says "This add-on has been disabled by an administrator". A statement will follow. Update 2:Here comes the statement. "Mozilla reviews and responds expeditiously to reports of abuse. 'Men Kampf' was removed after Mozilla received such reports today and it was determined that the add-on violates our Conditions of Use", says Mozilla director of marketplace and content ecosystem Bertrand Neveux. As you can see, Mozilla acted swiftly to remove the extension from the Firefox add-ons store, following reports. Meanwhile, the similar Men Kampf for Chrome continues to be available in Chrome Web Store.